Industrial activities play an important role in the economic well-being of Europe contributing to sustainable growth but can also have a significant impact on the environment. Directive 2010/75/EU on industrial emissions (IED): This establishes the main principles for permitting and control of large industrial installations based on an integrated approach and the application of best available techniques (BAT). BAT is the most effective techniques to achieve a high level of environmental protection, taking into account the costs and benefits. Directive (EU) 2015/2193 on medium combustion plants (MCPD): The MCPD regulates emissions of sulphur dioxide, nitrogen oxides and dust from the combustion of fuels in plants with a rated thermal input between 1 and 50 MW thermal. Directive 1994/63/EC and Directive 2009/126/EC on petrol storage & distribution: These related directives reduce volatile organic compound emissions to the atmosphere by imposing measures on storage and distribution of petrol. Regulation 166/2006 on the European Pollutant Release and Transfer Register: This register gives public access to detailed information on the emissions and the off-site transfers of pollutants and waste from around 30 000 industrial facilities. 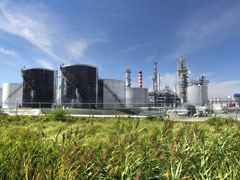 Specific case studies provide evidence of progress towards cleaner industry and improved environmental quality. A number of these successes are described in a series of leaflets available at the publications tab. Directive 2001/80/EC on large combustion plants (LCP).